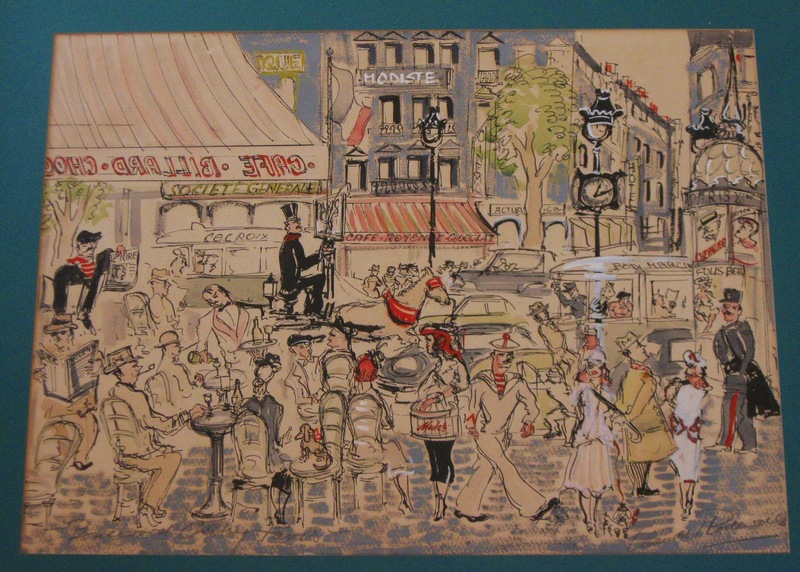 This painting of Paris, entitled “Boulevard Clichy, Paris,” hung in our house all of my childhood. To me, it was Paris – everything that Paris could and should be. 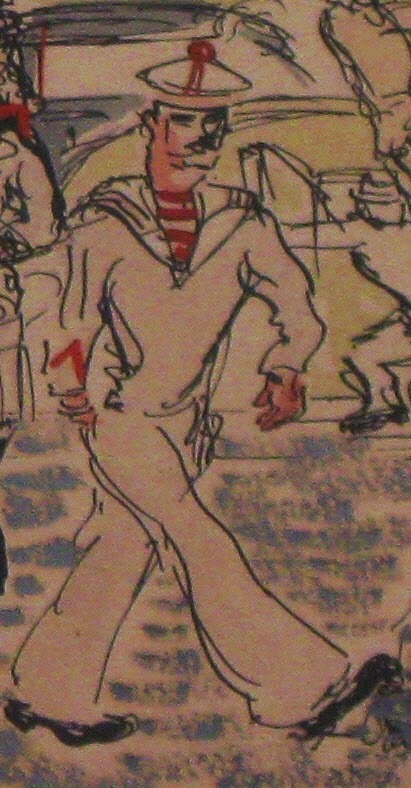 The café –its servers and clients – the gendarme, the sailor, the Morris column (Colonne Morris) advertising the next Maurice Chevalier show, the flaneurs, the street signs. My parents acquired it, I think, during a trip through Europe in 1959 or 1960. Hmm. Is it real or mythologized Paris of that era? But it was always a bit in the background; that is, I never really studied it too closely, but rather soaked up its total Parisian-ness. Did this influence my Francophilia? No doubt. But mostly I remember wondering, at a tender age, why the words “Café- Billard-Chocolat” were backwards. And the epiphany: because we’re looking at the back side of the awning. Brilliant young moi. When I moved to my first apartment after college, my father gave me this painting to hang in the living room. It was an instant inspiration. I loved the frame, which is a distinctly French style that I can only liken to a mansard roof perhaps seen in some Madeline books? ): the edges curve up toward the center. I loved the bustling street life of Paris. The Modiste, the Cinema, the Société Générale, everything. By the time I moved to Paris for three years, I had carefully placed the painting in storage. It wasn't until after my return that I studied it anew. Wow. Some revelations. 1. First, it really is a kind of “Where’s Waldo?” (Ou est Charlie?) of Paris café/street life in the late 1950s. So many details to discover. 2. Second, the artist got a number of details wrong. I count at least three, and that’s without spending too much time on it. Can you spot them? (I don’t include sloppy painting details -- such as the man’s umbrella impaling that poor woman -- in this tally.) It makes me wonder if it was painted en plein air or from memory. Zoom in and check them out and tel me what you think. 3. 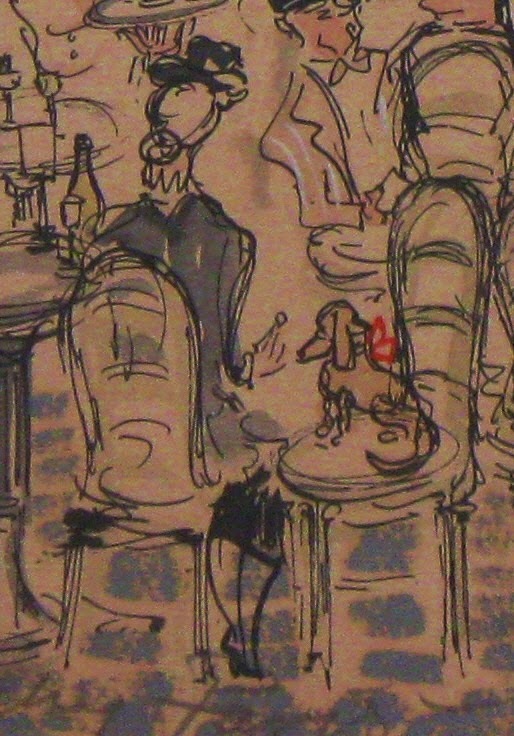 I have figured out (I think) that this was painted from under the canopy at the famous Wepler. It certainly had a café and billiards at the time. Any thoughts? 4. The cocher (coachman) and horse were about to become extinct. The last horse-drawn carriage in Paris (from the original fiacres) was in 1965. There have been some attempts at tourist-y revivals since then. 5. The man in sunglasses reading a newspaper entitled La Bourse Parisienne may have indeed been reading about the stock market, but there was no such newspaper, so maybe he was using that as a cover? On the other hand, the guy hawking Le Rire is valid; it was a satirical journal published in Paris through the late 1950s. But some things never change. I love this lady feeding her dog at the table. I think I might make this the new banner for Polly-Vous Francais? Just because. What do you think?